Well, after a new high resolution cylindrical map of Pluto has become available by Sep. 24, 2015, I thought I might devote some more serious efforts to creating a corresponding texture for celestia.Sci and Celestia. 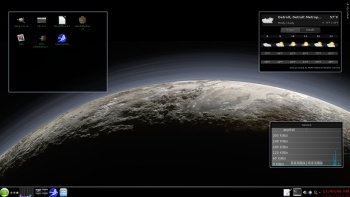 The new, officially released NASA/NewHorizons data of Sep. 24 concern a cylindrical projection map of Pluto, in enhanced, extended color, being the most detailed color map of Pluto ever made. http://www.jpl.nasa.gov/spaceimages/det ... d=PIA19956. Yet the corresponding official resolution is "only" 5999x3000 pix. However, another texture file named pmap_pmc195_8092-shenk.jpg with the same content, but much higher resolution (11465x5733) is available from various web sources. The map covers less terrain than the above base texture PIA19858. For celestia.Sci or Celestia we want Natural Color rendering rather than Enhanced Extended Color, despite the cognitive merits of the latter. Hence, the next step was to first convert the extended color rendering also to grayscale via the GIMP and then to superimpose the two gray maps as layers. Note that a non-negligible re-alignment of the two cylindrical maps was required! http://www.nasa.gov/sites/default/files ... -color.jpg, as a color reference in the automatic GIMP colorization module. After some remaining small touch-ups, I'll release the resulting 16k texture for download. Here is a qualitative comparison of a zoomed view in celestia.Sci that roughly matches a great grayscale NewHorizon(NH) Photo released Sep. 17 2015 (http://pluto.jhuapl.edu/Multimedia/Scie ... age_id=308). (Note: no Normalmap yet, hence mountains look too flat (squeezed)!). This configuration is very sensitive to the used orbital and other parameters, since the backlit haze is only visible shortly before sunset! At this point the orbital elements and other parameters of Pluto have not yet been updated. Hence shifts in time are to be expected. Great results here! Out of interest is there any colour information for the backlit haze, I've only seen the grayscale images. 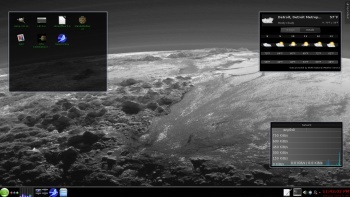 since quite a while I am scanning the net carefully for color info about the backlit configuration of Pluto. There is one further colored image (Wikipedia), the color of which seems theory-based as well. No direct color measurements published as far as I can tell...unfortunately! For the view in my post above this one (download/file.php?id=928&mode=view), I have meanwhile implemented more accurate solarsys.ssc settings, which -- for the last image in my previous post -- imply a haze color quite similar to the overall surface color. This effect I had already suspected above. 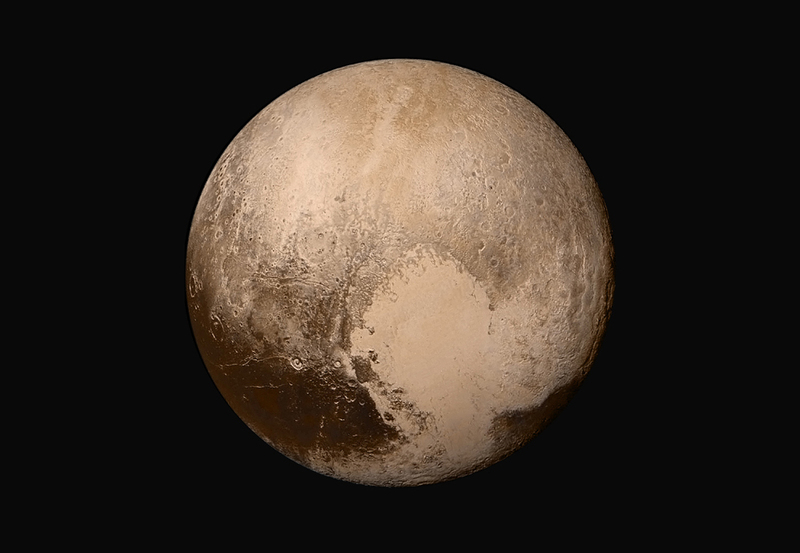 the colored Pluto photo looks certainly appealing. But what color scheme was used? If any, it is presumably enhanced, extended color and certainly not true color. Of course, it's fine as a wallpaper. I'd appreciate if you can find the link for that image. Presumably it's from deep down in the posting tree of UMSF ? Many thanks John! I searched for Ngunn in UMSF and thus could hardly succeed . Unfortunately, there is no further specification about the used color, just a loose reference to the MVIC camera, the color imaging features of which were not used though. I read in a NH article that the image in question, download/file.php?id=927&mode=view, is presently available only as a one channel (grayscale) photo, simply for reasons of saving time in the image transfer from Pluto. After all, color images take 3 times as long as mono images. I used the latest image of Pluto, http://pluto.jhuapl.edu/Multimedia/Scie ... /Shenk.jpg, in enhanced, extended color as a color reference in TheGimp coloration module, as applied to download/file.php?id=927&mode=view. Indeed ...and very surprisingly! In your quote Alan Stern, the NewHorizons principal investigator states e.g. Reproducing the blue halo of backlit Pluto turned out to be a challenge that was less easy than I thought at first. Henyey-Greenstein phase function parameter for wavelength independent scattering. A floating point value between -1 and 1, with -1 indicating complete backscattering, 1 complete forward scattering, and 0 isotropy. Wavelength dependent scattering coefficients. Three values giving fraction of red, green, and blue light scattered per kilometer at the planet's surface. To simulate Rayleigh scattering, they should be in ratios that fit the 1/wavelength^4 behavior, though this is not required. Scale height for wavelength dependent scattering. Currently ignored; MieScaleHeight is used for both Rayleigh and Mie scattering. Three values giving the fraction of red, green, and blue light absorbed per kilometer at the planet's surface. is responsible for the conspicuous "ring of light"
the Absorption RGB values specify the amount of absorption as visible in the backlit color composition of the "ring of light". R=0.0 means red remains (i.e undergoes ZERO absorption)! Etc. As you see there a quite a few free parameters to fix which is all but straightforward. Implying blue skies on Pluto! The backlit atmosphere looks great, but the atmosphere is too visible from the front in the .Sci rendering. There is no halo visible from the front in NH images. I guess the backlit halo is only visible in NH images because of the likely image enhancement, and/or sensor dynamic range.